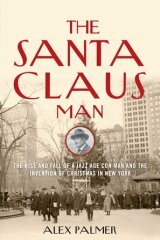 The true story of John Duval Gluck, founder of the Santa Claus Association in 1913, which had the sole authority to answer Santa's mail in New York City. He ran the organization for 15 years, gaining fame for making the myth of Santa a reality to poor children by arranging for donors to deliver the toys they requested, until a crusading charity commissioner exposed Gluck as a fraud. The story is wide in scope, interweaving a phony Boy Scout group, kidnapping, stolen artwork, and appearances by the era's biggest stars and New York City’s most famous landmarks. The book is both a personal story and a far-reaching historical one, tracing the history of Christmas celebration in America and the invention of Santa Claus.